There are many exciting developments currently underway within our City. 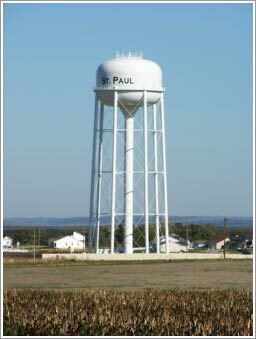 The City now owns the St. Paul water tower located to our northern most boundary. The water tower operator is East Central Missouri Water and Sewer Authority and currently serves the residents of the Riverdale development. The city board with direction from our city engineering firm has determined the environmentally necessitated sanitation improvements required in the Old Town area of St. Paul. Engineering studies now outlined determined the design, scope and implementation for this sewer system. The project RFP (Request for Proposal) is commencing. Once the project is underway, the estimated completion of this project is two years. Stone Castle, situated near Hwy P and Hoff Rd is St. Paul’s flagship Gated Community. Here you will find 37 pristine home sites all 3 acres in design. This development is for your custom designed home. Lake lots are available. The grandeur of the The Estates at Matteson Park development can be seen from the breathtaking entrance on Koch Rd. This custom development offers 3-acre home sites for your selection. Your custom “Country Estate” within this development awaits you. The Castle Creek” 3 acre per custom home site development is beginning brisk sales of delightfully wooded and serene lot choices. This development is all custom home sites situated off Koch Rd near Mueller Rd. Stone Ridge Meadows offers 1-acre lots for your custom designed home to become your dream. Many of these home sites back to woods for complete privacy. Follow Mueller Rd to the namesake “Grandma’s Lane” to find your long awaited lifestyle home site. Sigmund Place Estates is an upcoming development offering custom 1-acre home sites conveniently located along Hwy P, just minutes from I-70. A builder for this development, Esteem Homes, offers a full array of custom design building capabilities for you within this upscale development. A planned proposal for Cedar Lake subdivision is underway for a 3-acre community to be developed. Cedar Lake is proposed to be situated at the corner of Mueller Rd and Grandma’s Lane. These custom home sites are planned to offer full lake view and lake access. Riverdale Manors and Riverdale Meadows are beautifully planned communities being built by T.R. Hughes. Riverdale Manors offers larger lot sizes with breathtaking views. Both are located just minutes from I-70, 7 miles north on Hwy 79 then left on Riverdale Park Dr. Here you will find a family friendly community with planned parks, pavilions and two recreational lakes for your enjoyment. A relaxed living lifestyle in the quaint City of St. Paul. To find out more about any of these communities, check the business listings for the community builder’s information or contact City Hall.